bbisff_2017_trailer from t-shOrt - Χατζημιχαηλ on Vimeo. ΤΟ ΦΕΣΤΙΒΑΛ ΟΛΟΚΛΗΡΩΘΗΚΕ ΣΤΙΣ 10 ΜΑΙΟΥ 2017. THE FESTIVAL FINISHED ON MAY 10, 2017. Στο ειδικό πρόγραμμα «Αφιέρωμα στην ανεργία» στο πρόγραμμα 21:00 – 23:00 της 10ης Μαΐου (στο οποίο θα ανακοινωθούν και τα βραβεία) η είσοδος είναι δωρεάν για όλους και με πρόσβαση στα ΑΜΕΑ. Ειδικό πρόγραμμα «Αφιέρωμα στην ανεργία» με είσοδο ελεύθερη για όλους και πρόσβαση στα ΑΜΕΑ. Στο πρόγραμμα αυτό θα ανακοινωθούν και τα βραβεία. This year (2017) the BBisff established as annual competition of short films, (BigBang International Short Film Festival), with a different theme every year. For this year's edition (2017) the theme relates to the question "Unemployment". Almost 1000 submissions from all around the world have exceeded our wildest expectations. 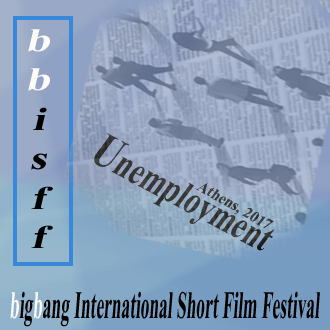 The “UNEMPLOYMENT” theme in this BBISFF 2017 is implemented through theOperational Program "Human Resources Development, Education and Lifelong Learning" and is co-financed by the European Union (European Social Fund) and Greek national funds. Τhe tribute «Unemployment» is implemented through the Operational Program "Human Resources Development, Education and Lifelong Learning" and is co-financed by the European Union (European Social Fund) and Greek national funds. Its co-funded projects deal mostly with the improvement of education and employment in Greece. Its main targets relate to the development and promotion of human resources skills, activities against unemployment, strengthen social cohesion and social inclusion of vulnerable social groups, improvement of the quality of education & lifelong learning, awareness on environmental education, linking education with the labor market. 1-day tickets: 4 euro / 2-day tickets: 7 euro. On May the 10th at the 21:00 - 23:00 program, where the awards will be announced, the entrance will be free. Το «BIG BANG INTERNATIONAL SHORT FILM FESTIVAL» (BBISFF), είναι διεθνές φεστιβάλ ταινιών μικρού μήκους, τόσο διαδικτυακό όσο και live προβολών, που διοργανώνεται από την t-shOrt (www.t-short.gr) και φιλοξενείται στον μεγαλύτερο ιστοχώρο για την μικρού μήκους ταινία στην Ελλάδα, το www.shortfilm.gr. Φέτος για πρώτη φορά στην ιστορία του ο θεσμός «BIG BANG INTERNATIONAL SHORT FILM FESTIVAL», φιλοξενεί μία ιδιαίτερη ενότητα με θέμα «ΑΝΕΡΓΙΑ». Η ενότητα αυτή υλοποιείται στο πλαίσιο του Επιχειρησιακού Προγράμματος "Ανάπτυξη Ανθρώπινου Δυναμικού, Εκπαίδευση και Δια Βίου Μάθηση" και συγχρηματοδοτείται από το Ευρωπαϊκό Κοινωνικό Ταμείο και από εθνικούς πόρους. Πρόκειται ουσιαστικά για το Επιχειρησιακό Πρόγραμμα του ΕΣΠΑ που ασχολείται με την εκπαίδευση και την απασχόληση. Το κινηματογραφικό αφιέρωμα με θέμα «ΑΝΕΡΓΙΑ» πραγματοποιείται στο πλαίσιο των επετειακών εκδηλώσεων για τα 60 χρόνια του Ευρωπαϊκού Κοινωνικού Ταμείου και παράλληλα συμμετέχει στις δράσεις της πανευρωπαϊκής εκστρατείας επικοινωνίας Η Ευρώπη στην περιοχή μου 2017(Europe in my Region), η οποία στοχεύει να ενθαρρύνει τους πολίτες να δουν και να μάθουν περισσότερα για τα έργα που συγχρηματοδοτεί η Ευρωπαϊκή Ένωση στην περιοχή τους. Εισιτήρια: Ημερήσιο 4 ευρώ, Διήμερο 7 ευρώ. Στο πρόγραμμα 21:00 – 23:00 της 10ης Μαΐου (στο οποίο θα ανακοινωθούν και τα βραβεία) η είσοδος είναι δωρεάν. 1-9 MAY 2017 SPECIAL PROJECTION OF THE CHOSEN FILMS FOR THE 3MEMBER COMMITTEE. The BigBang International Short Film Festival is an online and live screening festival. It is arranged by t-shOrt (www.t-short.gr ) and hosted by the ultimate and biggest short film website in Greece www.shortfilm.gr. The “Unemployment” theme aims to highlight the issue of global unemployment through the form of the aesthetic style of short films. A short film can depict briefly, flexibly, concentrated and highly opinionated topics like “unemployment”, and transmit them through a fresh, youthful and bold perspective. Due to the economic crisis and the unemployment that has spread through it, the chosen theme for 2017 is “UNEMPLOYMENT”. This is not only a concern that evolves around Greece, but resonates internationally since more or less most countries are troubled over it. The international economic crisis that has been imposed on people's lives, constantly creates new situations and requires an ever changing psychological mode from one country to another and from one current status to the next. The festival and the "Unemployment" tribute is implemented through the Operational Program "Human Resources Development, Education and Lifelong Learning" and is co-financed by the European Union (European Social Fund) and Greek national funds, with the intension to raise awareness around important matters. Even though the support involves organizing events within a national range, we decided it would be better and more fruitful to work with the topic of “Unemployment” through an international dimension. …these and other related topics is what the festival is interested in. Information of the festival can be viewed through various internet sites, mass media, newsletters, TV broadcasts, social media, facebook, twitter, etc.